Wooden Duckling - Waldorf inspired wooden animals by Holztiger are large, quality crafted and simply designed figures that encourage imagination and open doors to creative, open-ended play. Each Holztiger figure is lovingly handcrafted from maple or beech wood and painted with non-toxic water-based dyes in Europe. A water-based finish is applied to each figure to make them resistant to perspiration and saliva. 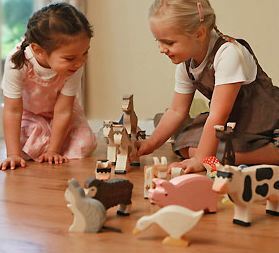 Explore Holztiger's colourful world of wooden figures, from wooden animals to wooden knight figures, all wonderfully designed to stimulate your children's imagination.